Maybe it’s the recent Chinese New Year (Tuesday, if you overlooked it), but it seems like there’s been more chatter about Chinese equities lately. More likely, though, it has to do with speculation about a potential rebound in the Chinese market after a brutal 2018, and the fact that some of the most actively traded Chinese stocks have recently released earnings, or are about to. As punishing as last year’s market may have seemed to US investors, consider the Shanghai Composite Index (SSE) lost around -25% in 2018, compared to a -6.7% loss for the S&P 500 (SPX). This chart dates back to early April 2018, which is around the time IQ started trading in the US. 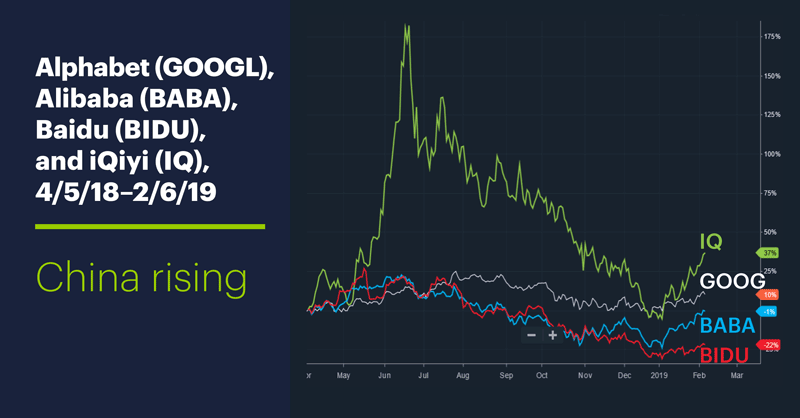 Aside from IQ’s parabolic up move in May–June 2018, the four stocks followed a similar trajectory, bottoming out in late December or early January. Does BABA’s post-earnings bullishness portend anything for its fellow Chinese tech stocks? A couple of takeaways from its report was that profits (as opposed to revenues) blew away estimates, and the company’s outlook played down the potential impact of the US–China trade spat1—a possibly soothing bit of news for still-skittish bulls worried about how Chinese companies were handling the stress. IQ (above) has actually been on fire so far in 2019, up more than 40% on the year after falling below $15 in December. 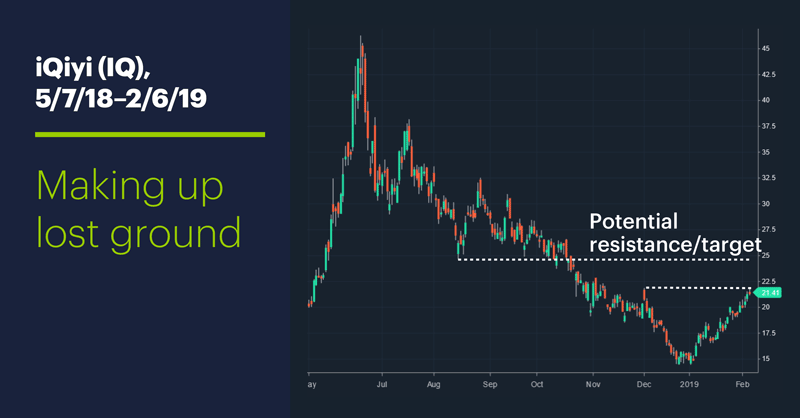 Yesterday the stock approached its early December high around $22, with a possible resistance level around $25 (the level of the August-September lows) looming as the stock’s next technical target. The flames could certainly die down a bit, but more solid numbers from this and other frontline Chinese stocks could set the tone for the near future. By the way, it’s the Year of the Pig in the Chinese zodiac, so maybe traders will want to keep an eye on hog futures, too. Market Mover Update: Shares in Biopharma company Macrogenics (MGNX) more than doubled yesterday on news of successful trial results from its breast-cancer drug, but pulled back from a 300% intraday gain. Today’s numbers (all times ET): Bank of England announcement/minutes 7:00 a.m.), EIA Natural Gas Report 10:30 a.m.), Consumer Credit 3 p.m.). Today’s earnings include: Cardinal Health (CAH), Dunkin (DNKN), Fiat Chrysler (FCAU), First Data (FDC), GrubHub (GRUB), IntercontinentalExchange (ICE), Kellogg (K), Laboratory Corp (LH), Marathon Petroleum (MPC), Twitter (TWTR), Tyson Foods (TSN), Yum! Brands (YUM), Mattel (MAT), Qorvo (QRVO), Teradata (TDC), VeriSign (VRSN). 1 Reuters. UPDATE 4-Alibaba stock rallies on handsome profit beat, optimistic commentary. 1/30/19.